[handwriting]: West Shore Mag. Mines & works of the Oregon Iron and Steel Co. at Oswego, Ore. 693. [stamp]: Oregon Historical Society duplication rights stamp. Negative Number [handwriting] ORHI 39713. 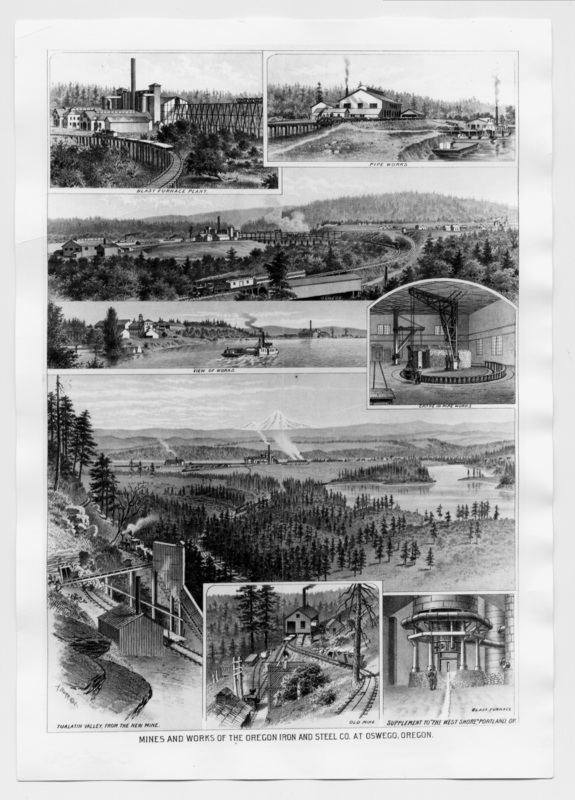 Description B & W photograph of a sepia colored poster published as a supplement to "The West Shore" Portland, OR. [Captions]: Mines and works of the Oregon Iron and Steel Co. at Oswego, Oregon; Blast furnace plant; Pipe works; View of works; Crane in pipe works; Tualatin Valley from the new mine; Old mine; Blast furnace. Same image as 191 a & c, & 2498. The library also owns an original framed and an unframed copy of this poster. Transcription [handwriting]: West Shore Mag. Mines & works of the Oregon Iron and Steel Co. at Oswego, Ore. 693. [stamp]: Oregon Historical Society duplication rights stamp. Negative Number [handwriting] ORHI 39713. Rights Information Contact Oregon Historical Society for permission to duplicate. 503-306-5252; 503-222-1741.